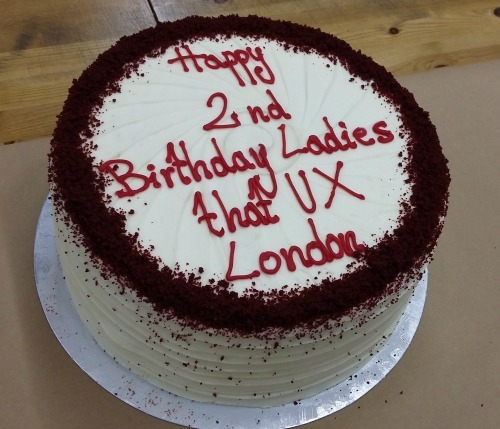 This months Ladies that UX meeting was held at the offices of Rated People and was as much to celebrate the groups 2nd birthday as to talk about how to use our skills for charities and non for profit organisations. Now that's what I call a cake! We were very lucky to hear from Claire Munday who has worked with different organisations while still working full time for at least 10 years. She was a great speaker, easy to listen to, funny and with useful things to say. The thing she emphasised most was how much more she feels she has got from volunteering than they have got from her. After all they only got a website, while she found joy in helping people, met new friends, learnt new confidence in her own work and finally felt useful. "Be honest about what you can do then do it"
Look after yourself. You are not helping anyone if you work all the hours under the sun and have a break down. Be clear about what you can do and stick to it. Make sure you design with them, they will REALLY know their audience. Partner up with people who have skills you do not and work together. Forget the rules, find what works for the Charity. As Claire said be honest about what you can do then do it. You don't have to redesign their whole website, but maybe you can help with their content or SEO. They will be grateful for anything you can do, because most charities have little or no funding. It was a really inspiring talk as was the discussion after. And it has come just as I have been looking into how to use my powers for good and looking at volunteering opportunities myself. April's meeting, which is the second part, will see us use our skills to work on a real problem. I look forward to the challenge.